Tell us a random fact about yourself: In my early years I was a sprinter for Norfolk – a potential career halted by getting hit by a car whilst crossing the street. Don’t feel bad for me though as it was during my recovery that I first started writing stories. Where is your dream holiday destination? I would love to go travelling and see more of the world. I enjoy a relaxing beach holiday as much as the next person but to be honest I get bored really, really easily and need to be doing something – whether it be going on hikes, scuba diving, visiting famous landmarks. My recent trips have been Tokyo, Cyprus, Marrakech, Malta, Rome, New York and Mexico – so I certainly like to mix it up. What is your all-time favourite food? I don’t really have an absolute favourite – a good meal with family and good friends is just fine by me. What is your favourite Take-Away choice? Chinese – Sweet & Sour Chicken all the way! If you like to cook, which dish do you enjoy preparing and cooking yourself? My spaghetti bolognaise is always a favourite but nobody can beat my (British) Sunday roasts (except my mum’s!). Do you enjoy baking? If so what is your favourite food item you love to bake? I’m not a baker at all I’m afraid although I’m always tempted to give it a go around Bake Off time. What is the one dessert you can never resist? Apple crumble…the more crumble the better! Which of your book characters has a lot of you in them? Definitely Adam Hunter or his brother Matt. The way both react to the world around them – their interests and wonder in the historical mysteries they uncover would certainly be me and maybe I am living through these characters as I would love to see and experience all that they are. There is also Adam’s recklessness and failure to listen to anyone when they tell him he cannot do something – that is absolutely me at times. Who so far, has been your favourite character to write? Probably Emma Lovell – she just sees and tells things exactly as they are and is probably the most realistic of the characters. Gabriel Quinn is also a close second – mainly for his quirkiness and ‘doesn’t-give-a-damn’ attitude, especially in Book Two. If you could be any character from any book, who would you be and why? Without a doubt it would have to be Richard Sharpe from the Bernard Cornwell Sharpe series. Sharpe is born in the gutter and rises through the ranks of the British Army during the Napoleonic war, despite being shunned by the gentry. He is a true hero and rogue who defeats the enemy (and usually the incompetent or dangerous officers in his own army) and gets the girl every time. Is there one of your book characters that you have disliked or do you love them all in some way, even the bad guys? I cannot say too much as it would reveal one of the big twists of book two – but there is certainly a character that I have a love-hate relationship with who is a joy to write for but for all the wrong reasons. What car do you drive? I currently drive a two seater Mazda MX-5, but this is likely to change as come September I will begin a whole new adventure – fatherhood! What is your dream car? To be honest I always wanted the MX-5 so I’ve already ticked that one off. A lotus would be nice or a James Bond style Aston Martin. Which celebrity did you have a crush on as a teenager? Rachel Stevens (S-Club 7) – I can still remember the words to some of the songs. What is your favourite movie of all-time? Gladiator, Raiders of the Lost Ark, Aliens and Star Wars (original trilogy) are all up there but I’d probably have to go for Terminator 2 for this one – I saw this when I was far too young (thanks Mum) and have always thought it was the perfect family film – a wayward child, a mother trying to protect her son and a surrogate father learning to love…with an invincible machine hell-bent on killing them all – as I said, the perfect family film! Who is your favourite band/singer of all-time? I’m a big fan of 30 Seconds To Mars and Royale Blood at the moment but for all time I would have to say the Foo Fighters who I was lucky to see a couple of years ago – Dave Grohl on his mobile throne after breaking his leg. I am currently working on the Young Adult adventure and historical series ‘Relic Hunters’. 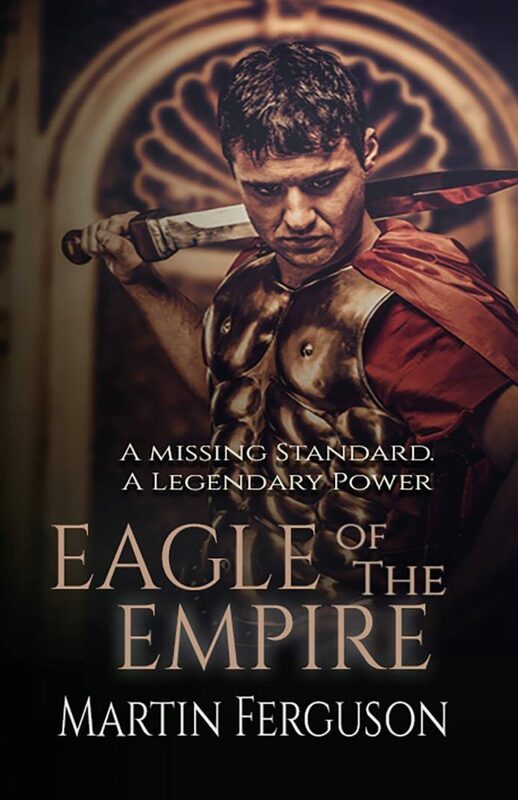 Inspired by the myths and legends my parents told me as a boy and with the help of my ever-suffering wife, a teacher and history graduate, ‘Relic Hunters’ was born with its first entry ‘Eagle of the Empire’, with the second entry in the series ‘Curse of the Sands’ due for release in June 2017. When not writing I am training or at least planning my next challenge. Following a serious knee injury, I was told by surgeons never to run or play any sports again. Stubborn and reckless, much like the characters in my writing, I have not listened and have completed marathons and charity challenges whenever I get the chance. This includes the Great North Run in 2016 and the Greater Manchester Marathon in 2017. Relic Hunters: Book 1: Eagle of the Empire is already available in eBook and paperback and Book 2: Curse of the Sands will be released on 1st June 2017. 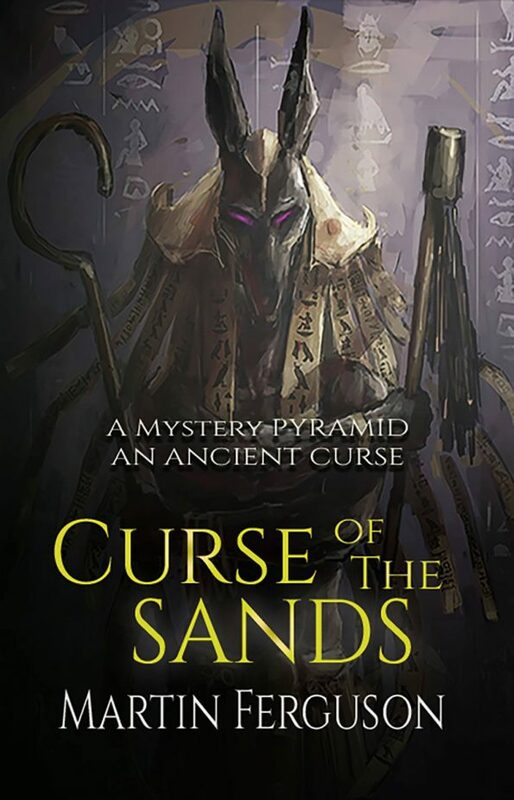 Thousands of miles away from London and The British Museum, in the mysterious Land of The Pharaohs, a pyramid has been discovered, or more accurately, one has suddenly appeared. fellow members of the British Museum team, to unlock both the pyramid’s secrets and its relics. Only, not all is as it seems, and as the treasure hunters begin to die one by one, it soon becomes apparent. the pyramid has its own vengeful agenda. In this second book of The Relic Hunters’ Series, seventeen-year-old Adam Hunter must learn to work as part of the team in order to save the day and win the heart of the girl he’s falling for. 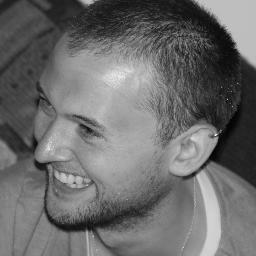 Thank you Martin Ferguson for taking part in my fun author interview.